Shane Black’s The Predator is un-apologetically R-rated, features a slew of respectable actors, is directed by a celebrated writer/filmmaker and features one of science fiction’s most unquestionably awesome alien killing machines. So why is it that I’m still disappointed? A predator spacecraft crash-lands near an American sniper named Quinn (Boyd Holbrook), he scavenges the ship for evidence and ships his findings back home. Rory, Quinn’s son, discovers the packages and accidentally activates the alien technology within, which leads two predators with very different objectives directly to his location. Quinn, a scientist and a rag-tag group of ex-soldiers/convicts take it upon themselves to rescue Rory and eliminate the predators, all while fending off a secret organization that wants to capture and contain both the predators and Quinn’s entourage. When you think of the predator, what comes to mind? For me, the first thing I think of is the grotesque, mandible-covered visage of the titular alien, its humanoid/reptilian body decked out in armor and a various array of weapons designed for maximum dismemberment mounted upon its shoulders and along its wrists. Then I think of Arnold Schwarzenegger, his goofy charisma and the ridiculous amount of times I’ve used his “get to the choppa” line in everyday conversation. Finally, I think about the clash between these two titans of muscle and bad-assery in a foreign jungle where they both belong, and I am at peace. The latest film in the Predator franchise, The Predator, ticks most of the boxes but somehow never comes together in a satisfying way. There was a lot of anticipation for this film when it was revealed that Shane Black would be taking the reigns. Black wrote Lethal Weapon, starred in the original Predator, directed critical darlings such as Kiss Kiss Bang Bang and The Nice Guys and is known for always subverting genre tropes in an interesting way. He very well could have made a truly unique and worthy entry in the storied Predator franchise. For better or worse, The Predator takes the least risks of all of Black’s films, which is not to say that it doesn’t do a fair amount of things differently, it just happens far less often than I would have liked from a sequel that has been 10 years in the making. The movie can be entertaining at times, but rarely any more than that. At the very least, it does seem like the filmmakers knew what a Predator film should look and feel like in this day and age whilst still being faithful to the original 1987 property. Though I will say that some of the jokes are surprisingly tone-deaf and could potentially be offensive for viewers that are unable to overlook political incorrectness. If this film merely played it safe and had no other problems than the ones I just listed, it still could have been great, but there is one critical flaw that nearly derails the movie completely. The Predator falls victim to a confused narrative that consists of one too many plot tangents and a vague through-line of a story that just isn’t all that compelling. These films work better when they are simple, and this one is trying to be complex and failing radically at it. I just want a movie about big hulking men fighting an even bigger hulking alien until only one man, preferably Arnold Schwarzenegger, is left standing; thus initiating a testosterone-fueled mano-a-mano fight to the death. Okay, maybe I should just watch the original again. Still, I fully believe that this movie could have been much better had it just picked one story and pushed everything else to the side. The cast, though unremarkable, is game. Boyd Holbrook is a passable tough guy and much more charming than he was in last year’s Logan where he plays a walking-talking piece of cardboard. The real star here is Olivia Munn who ably balances camp with charm, in fact, she would have made for a better lead which also would have resulted in a simplified and more satisfying story. Trevante Rhodes plays Holbrook’s right-hand man, Nebraska Williams, he brings some heart to the proceedings but I never quite got a handle on his character enough to really care about him in the end. Thomas Jane and Keegan Michael Key are fine, but they play the shamelessly offensive comedic relief buddies, which would have been more excusable if their jokes were actually funny, but they’re really not. Finally, Sterling K. Brown camps it up as the human villain here, and seems to be the only one camping it up 100%. I enjoyed his presence, but also felt like he laid on the cheese a little too thick. 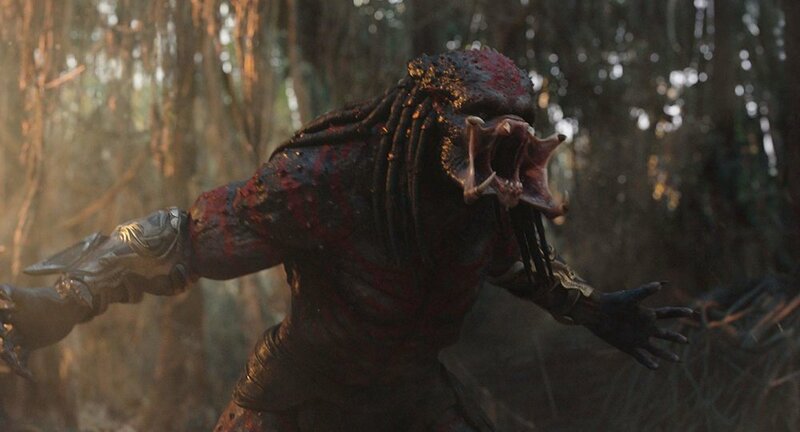 Shane Black’s The Predator is enjoyable to a degree, but I never felt like I was watching something new and original, which would have been excusable had it had at least told a coherent story, but it doesn’t. Still, I can’t hate this film. If all you want is bloody predator action, you’re going to get it here, and let’s face it, there are far worse directors whose laps this project could have landed in. It might not be the best in the series, but The Predator is…okay? Oct 26 Shane Black's 'The Predator' to be "Scary, Funny and Wondrous"